Three years of neo-liberal “reforms”; slashing state services; tax cuts; introducing labour market “flexibilities” – have produced very little gain for this country. On top of that are the run of scandals afflicting National; Nick Smith and Bronwyn Pullar; John Banks, Sky City, and Kim Dotcom; Murray McCully and MFAT; John Key’s secret deals with Sky City… It is an eye-opening litany of failure, stuff-ups, and dodgy dealings. Cue – the Spin Doctors. Encourage moral hysteria, before calling for “calm”. There is good reason why National has released this crazy plan at this point in time. It has nothing to do with assisting beneficiaries in any way, shape, or form. It has everything to do with deflecting attention from National’s own failures. If National was truly interested in assisting people with subsidised contreaception – it would offer this choice to everyone. And along with free contraception, National should be offering free dental care for children; meals in schools; and other programmes to help New Zealanders. Otherwise, Paula Bennett’s “offer” of subsidised contraception for beneficiaries should be seen for what it really is: Spin Doctors deflecting public attention away from National’s shocking economic performance. It’s pointing a finger and yelling, “Look over there“! 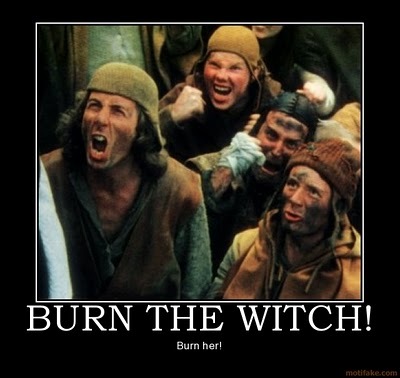 Once upon a time they burned women as witches. Absolutely right! Dental care for everybody, I’d add…. it would not be a stretch to add dental care to the rest of the health system. You’re also right, Frank that it’s a jolly good distraction! The msm with their super-short attention span, have had nothing to say about Banks for days – Banksie and ShonKey must be gasping with relief! Indeed, Debbie. In which case, I’d be up there at Parliament, happy-clapping for Key & co!! NZ governments have long sought to divide and rule – turning one group against another. Funny how the well-off happily accept WFF and, indeed, arrange their financial affairs to make themselves eligible, yet resent the poor getting “handouts”. Just what do the rednecks want? To go back to the days of shotgun weddings, forced adoptions and societal contempt for women who fell from grace? Why is it always young mothers who bring out this ugly streak? Strong emotional bonding between parent(s) and child is the optimum foundation for healthy, happy adults. I wonder what would happen if it was compulsory for at least one parent to stay at home and bond with their children for the first five years? Excellent points, Kerry – including some I hadn’t considered, such as WFF. You’re quite correct on that point; the Right are continually referring to WFF as “welfare for the middle classes” (I think Mathew Hooton uses that phrase quite often!). Those moralists also forget that the children born to solo-mums will be the workers and taxpayers of the future. They’ll be paying for superannuation when we retire, and they’re still working. So we’d better be damned nice to them, I think. You’re also right, Frank that it’s a jolly good distraction! … Banksie and ShonKey must be gasping with relief! Oh hell yes, Debbie – indeed! This is the BIG difference between the left and right. Left wing governments don’t pit people against people; groups against groups; majority against minority. If New Zealanders were a little more clued up, they understand what Key and Bennett were up to.